Seeing-eye dogs significantly improve the quality of life for people living with blindness. Unfortunately, BBC journalist, Mohammed Salim Patel, has a phobia of dogs which led him to give up on the assistance of a service animal, until he met Digby. 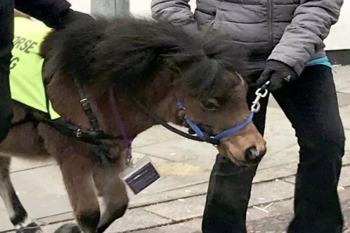 It turns out that dogs are not the only animals that can serve as guides for the visually impaired, Digby is an eight-month-old, two feet tall American miniature horse. If anybody has experience with a seeing-eye horse, we are interested to hear your thoughts. "Blind Man With a Fear of Dogs Gets a Guide Horse Instead"